Young tiger swallowtail larvae resemble bird droppings. Bird droppings, snake eyes, dead leaves: Swallowtails, Papilio spp. Large creepy eye spots of older swallowtail caterpillars may frighten would-be predators. A few weeks ago at a family cookout, I was presented with a lovely greenish caterpillar that had been rescued from a swimming pool. Aquatic habitats like swimming pools are unexpected places to find caterpillars, but the large tulip tree above the pool gave me a clue to the identity of this marvelous creature. Tulip trees a.k.a. tulip poplars, Liriodendron tulipifera, are large straight-trunked trees common in the eastern United States. Their leaves are toxic to nasty caterpillars like the gypsy moth, but fine fare for the young of one of our beautiful native butterflies, the tiger swallowtail, Papilio glaucus. It is impossible to know if this little beauty wandered from the tree in search of a quiet place to form a chrysalis and turn into a pupa, or if some hungry predator expedited a hasty departure from the leaves above the pool. Whatever the reason the caterpillar arrived in the drink, its rescue allowed us to witness one of the most remarkable transformations in nature. The tiger swallowtail and several of its close relative are masters of disguise. As you might imagine, plump juicy caterpillars are delicacies for a variety or birds, reptiles, and small mammals of all kinds. One way to gain protection from these hungry beasties is to engage in the art of masquerade and swallowtails are masters. So named for its dazzling pattern of alternating bands of yellow and black, the tiger swallowtail is a beautiful butterfly and a regular visitor to our gardens where it collects nectar and pollen from a variety of plants. These nutrients are used to produce small eggs deposited on leaves of some favored larval food plants like tulip tree, cherry, ash, and magnolia. 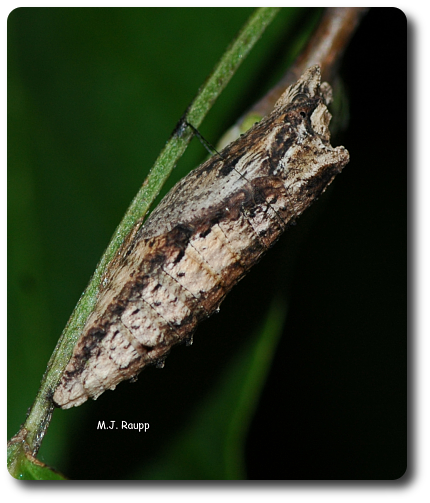 Predators might overlook a tasty pupa inside a chrysalis disguised as a withered leaf or twig. The inconspicuous eggs hatch into a larva that engages in masquerade number one – look like a bird dropping. I like most animals and the things they do, but animal droppings are, frankly, unappealing. Even hungry predators like birds are unlikely to connect bird droppings with dinner. For a juicy caterpillar, dressing up like a bird dropping is a very clever disguise. As the swallowtail grows larger and more apparent, a different masquerade is used. Disguise number two is to be bold and look dangerous like a snake. The later stages of the tiger swallowtail caterpillar are adorned with two large eyespots on the upper sides of their body. The eyespots are not true eyes, but only patterns of colors on the skin of the insect. Look closely at these. The eyespots are remarkably complete with pupils and irises. 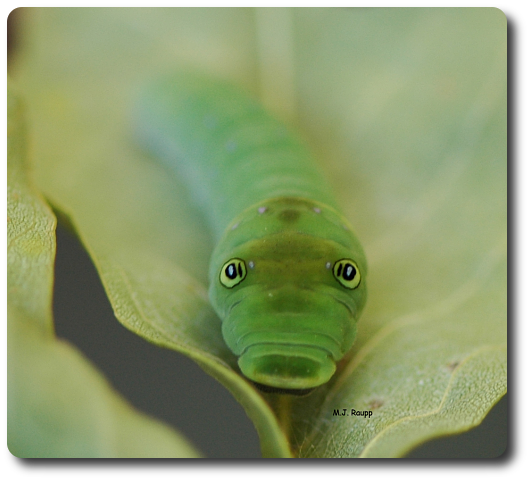 Viewed head-on, the larva of the tiger swallowtail looks like a green viper with very large eyes. Remember, snakes and birds are mortal enemies. Snakes often capture birds for dinner. Confronted by a sinuous creature with very large and scary eyes a bird may opt to seek its dinner elsewhere and the caterpillar’s trickery allows it to live another day. The final act of deception comes when it is time for the caterpillar to transform into a pupa. This time of immobility as the caterpillar changes from larva to pupa to adult is a time of extreme vulnerability to predators. To fool its enemies, the tiger swallowtail uses disguise number three. The caterpillar attaches to a twig or branch and sheds its skin to reveal a chrysalis resembling a withered leaf or twig. On a bright autumn afternoon when you see the gorgeous tiger swallowtail in your garden, know that you are company to a true master of disguise.